If a GoPro selfie just isn’t enough, a new service will film you skiing or riding popular runs at ski areas in North America and provide a professional edit — all shot by drone. To get this aerial perspective, Cape Productions will offer autonomous drone technology that follows skiers without the need for an operator. That means Cape’s drones automatically fly with you, filming from above as you ski or ride. Customers sign up, meet Cape on the mountain, and get filmed by the drones while riding, then receive a professionally edited video online. Resort partnerships include Winter Park Resort and Copper Mountain, Colo; Timberline Lodge and Mount Hood Meadows, Oregon; Powder Mountain, Utah; Homewood Mountain, Calif; Mountain Creek, New York; Fernie Alpine Resort, B.C. ; and Schweitzer Mountain, Idaho. Launch dates for each resort, as well as new resort locations, will be announced in November and continue through the season. 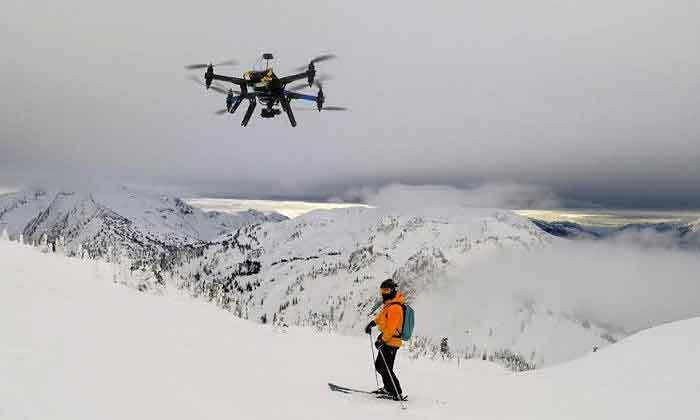 Drone use is banned at most major ski resorts, but Cape worked with government and resort officials to permit this service. Cape’s drone technology can fly up to 40 mph. The drones automatically maintain a safe distance from the ground and all major obstacles like trees, chairlifts and crowded areas and can withstand harsh weather conditions and high altitudes found at mountain resorts, according to the company. Cape has proven its technology, partnering with the U.S. Ski Team to capture training sessions of Olympic gold medalists Lindsey Vonn, Mikaela Shiffrin, Ted Ligety and other members of the team at Coronet Peak in Queenstown, new Zealand. It produced the video below, mixing ground-shots with aerial footage from its drone technology, to showcase the product. The service isn’t cheap, but given the price of lift tickets, it’s not outrageous. The cost for a Cape video package (3 runs with the drone and edited video) ranges from $100-$200 depending on the resort. Cape has raised more than $10 million from investors and is expanding its team and operations rapidly, so don’t be surprised to hear the whirring of drone props at resorts around North America soon. For more information about Cape, along with access to discounts for the service, visit www.cape.com.